The fast-evolving, modular Trojan DanaBot has undergone further changes, with the latest version featuring an entirely new communication protocol. The protocol, introduced to DanaBot at the end of January 2019, adds several layers of encryption to DanaBot’s C&C communication. Besides the changes in communication, DanaBot’s architecture and campaign IDs have also been modified. After being discovered in May 2018 as part of Australia-targeted spam campaigns, DanaBot has had an eventful time since, appearing in malspam campaigns in Poland, Italy, Germany, Austria and Ukraine, as well as in the United States. The European campaigns have seen the Trojan expanding its capabilities with new plugins and spam-sending features. In ESET telemetry on January 25, 2019, we noticed unusual DanaBot-related executables. Upon further inspection, these binaries were, indeed, revealed to be DanaBot variants, but using a different communication protocol to communicate with the C&C server. Starting January 26, 2019, DanaBot operators stopped building binaries with the old protocol. In the communication protocol used before January 25, packets were not encrypted in any way, as seen in Figure 1. Following the latest changes, DanaBot uses the AES and RSA encryption algorithms in its C&C communication. 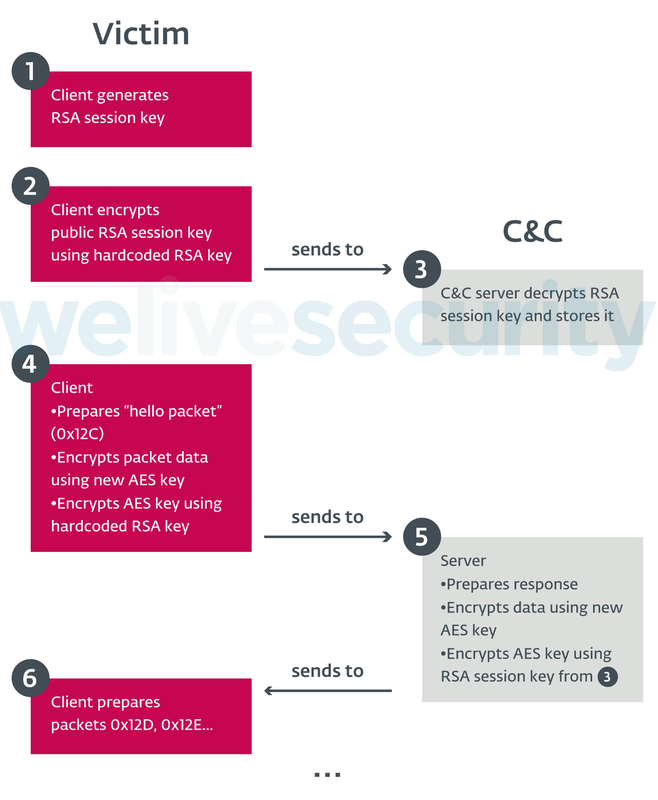 The new communication protocol is complicated, with several encryption layers being used, as seen in Figure 2. These changes break existing network-based signatures and make it more difficult to write new rules for Intrusion Detection and Prevention Systems. Also, without access to the corresponding RSA keys, it is impossible to decode sent or received packets; thus PCAP files from cloud-based analysis systems (such as ANY.RUN) become unusable for researchers. For each packet, the header is followed by AES-encrypted packet data, then a 4-byte value indicating AES padding size, and finally the RSA-encrypted AES key. Each packet is encrypted with a different AES key. Server responses use the same format. Unlike in previous versions, packet data in server responses does not follow any specific layout (with some exceptions). 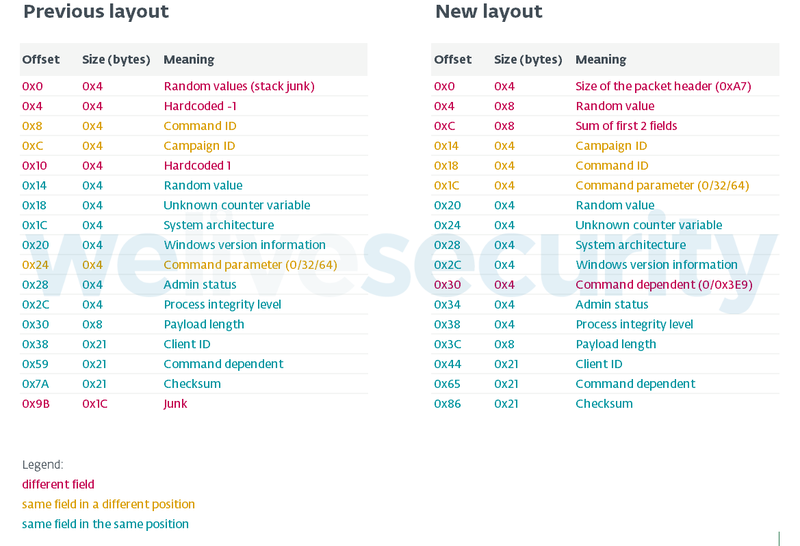 Former packet data layout was detailed by Proofpoint in October 2018. In the latest version of DanaBot, the layout is slightly modified, as seen in Figure 4. Besides the changed communication protocol, DanaBot has also undergone some changes in architecture. The previous versions of DanaBot included a component that downloaded and executed the main module. The main module then downloaded and executed plugins and configurations. The latest version shifts both these responsibilities to a new loader component, which is used to download all plugins along with the main module. Persistence is achieved by registering the loader component as a service. Downloaded plugins and configuration files are encrypted using an AES key derived from the Client ID. In addition to that, plugins are compressed in ZIP format using LZMA compression, whereas configuration files are compressed using zlib. Previous research has suggested that DanaBot is distributed under various “affiliate” or “campaign” IDs. In 2018, we observed DanaBot expanding in both distribution and functionality. The beginning of 2019 has seen the Trojan undergo “internal” changes, indicating active development by its authors. The latest updates suggest the authors are making an effort to evade detection at the network level, and possibly paying attention to published research and making changes to stay ahead of defenders. ESET systems detect and block all DanaBot components and plugins under detection names listed in the IoCs section. Note that since new builds of DanaBot’s components are released regularly, we provide just a sampling of hashes. Bulk Data: 1-3 What are you protecting?